Peer-to-Peer fundraisers will have their own personal fundraising page tied to your giving day profile where they can set their own fundraising goal, share their personal story, and can easily manage their page on GiveGab so your best supporters can be your best fundraisers too! The main draw of peer-to-peer fundraising is that it can really expand your reach to a new network - we've found on GiveGab that on average, a peer-to-peer fundraiser brings in 4 new donors per campaign! 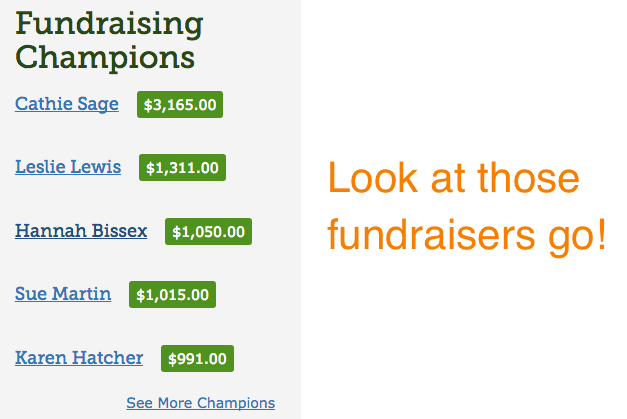 Your Giving Day profile has a built in Fundraiser Leaderboard, so use that to your fundraising advantage!